Look around where you are sitting for things that are the color brown. Then look for things that are red or blue. You will probably be surprised at how many things you can spot that are those colors, and you never really notice how many there are until you specifically look for them. The same can be said for plants mentioned in the Bible. As you are reading through the scriptures, you probably don't even notice how many times trees or flowers or wheat or weeds are mentioned. They are just part of the warp and woof of the text. Yet when you stop to count them, it is shocking how often they appear. 8 types of drugs, spices, incense & perfume. The seven species represented here are the seven types referred to by Moses in Deuteronomy 8:7-10. This photo captures all seven varieties of products in one shot. Barley and wheat are at the far left, each represented by its grains and a loaf of bread made from that type of grain. Vines are represented at the top of the photo by three types of grapes, along with a cup of wine and a plate of raisins. Figs are at the far right side of the picture: fresh figs (top) and dried figs (bottom). Pomegranates (two whole and one opened) can be seen at the top of the photo between the grapes and figs. 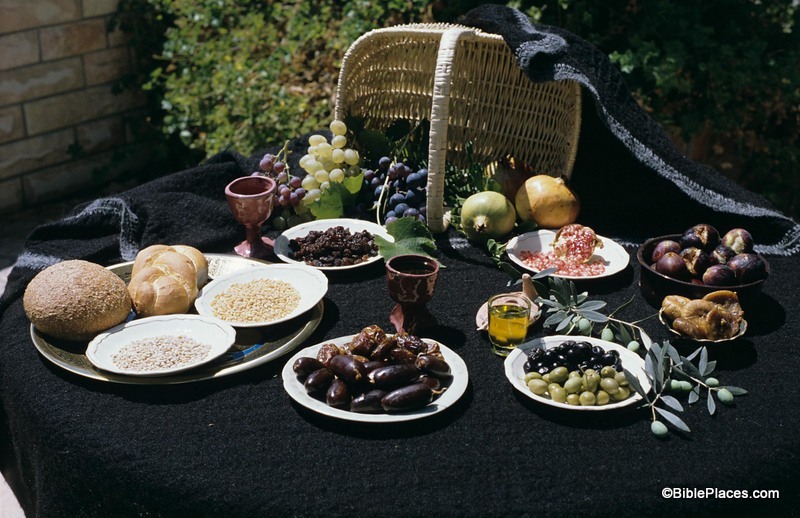 Olives are shown at the lower right side: both green and black olives along with a cup of olive oil, an oil lamp (behind the cup), and a branch from an olive tree. Lastly, honey is represented by dates at the bottom center of the photo. The juice that was squeezed from fresh dates was known as date honey, and can be seen in the cup just above the plate of fresh and dried dates. Some scholars believe that date honey instead of bee honey makes the most sense in this list of agricultural products. Once again, a picture is worth a thousand words. Seeing all seven species together on one table whets that appetite and drives home the message in a different way than merely reading the text. Looking at this feast, it is easy to see that this truly was a "good land" that God was giving to the Israelites. This and other photos of biblical plant life are included in Volume 16 of the Pictorial Library of Bible Lands and can be purchased here. For further thoughts on why Moses may have chosen to mention these seven species, see my blog post on the Wild Olive Shoot blog here. Although it is usually assumed that "dvash" (=honey) is date honey (probably something like Arabic "dibs"), with the recent find of Iron Age bee honey production at Tel Rehov, the possibility that bee honey as one of the seven species must be taken into account! I agree that bee honey cannot be ruled out. You have a good point. At the same time, Nogah Hareuveni in his work "Nature in Our Biblical Heritage" (p.35) supports his claim that the honey in Deut. 8 refers to date honey by citing the Jerusalem Talmud, Bikkurim 1:3. So there is some literary evidence for interpreting it in this way.